One may not use "essential oils" and "hardware store" in the same sentence often, but today there are more reasons than ever before to do just that! 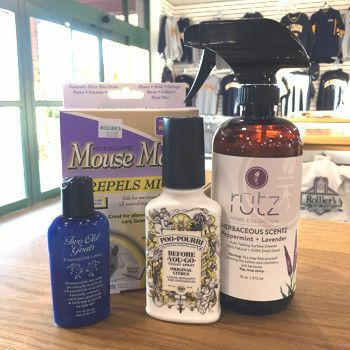 Some of our most unique and all-natural products are using essential oils for their strong aromas that can 'liven' the body, relieve tension, and even repel rodents! In this article, we focus on 4 particular products that put the natural benefits of essentials oils to the forefront. 1) Poo-Pourri - Helps to eliminate the scent of your poo and provides a pleasant, uplifting scent to the bathroom even after you just went poo! 2) Rutz Cleaners - Cleaner with essential oils that rejuvenate and energize the body. Makes cleaning more enjoyable and energizes your body. 4) Mouse Magic - Uses peppermint and spearmint oils to fend off mice and other rodents. The smell is appealing to us, but not to unwanted critters, which makes the use of these essential oils so great! 4) Two Old Goats Lotion - A goat milk moisturizing lotion combined with Aloe Vera, almond oil and 6 different essential oils that work as a natural anti-inflammatory and an analgesic. Includes German Chamomile, Lavender, Rosemary, Peppermint, Eucalyptus and Birch Bark. Thanks for reading everyone. We hope that you enjoyed this quick read!